All of our bowling lane constructions start off with the sub-floor, a bearers and joist structure that is below the lane surface. A well designed sub-structure is vitally important as this is the base that ensures that the laminated lane surface is perfectly level. The bearers and joists lift the bowling surface from the original floor, thereby ensuring a cushioning effect that eliminates excessive noise when the ball is dropped onto the lane. Furthermore, it allows for an underground ball return as sometimes required in Tenpin bowling and is high enough to create the depth needed for the ball pit. The pinsetters are mounted onto a front and back frame that is totally free standing and not attached to the pindeck or lane surface, making sure that there is no vibration transmitted to the pinsetter from the ball hitting the pins. 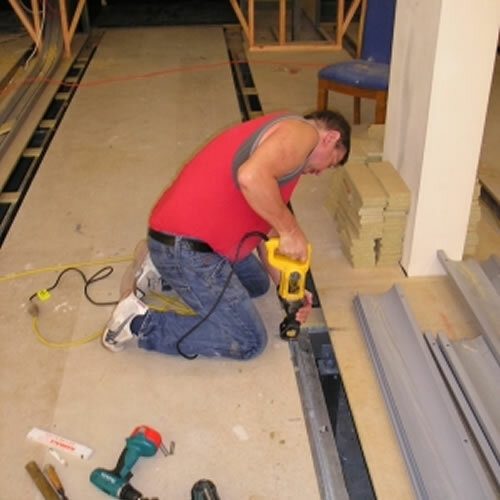 Our specially developed laminated lane surface is mounted onto the joists, with a layer of MDF or particle board in between and the gutters and automatic bumpers are fitted. The final precision leveling is now done. The masking wall is erected in front of the pinsetters with the purpose of hiding the machinery, so only the pins can be seen. Above each lane is a door for easy access to the pindeck and also for easy access for the cleaning of the lanes. The electronic control is mounted behind the masking wall; the ball return system is fitted and the bowlers console attached and connected.